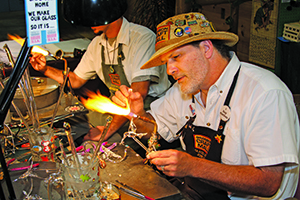 The Ozarks is known for its own brand of arts and crafts, and visitors to the Branson Craft Mall can experience it all in 16,000 square feet of artisans. From hand-painted home goods and holiday décor to iron works and candles, the Branson Craft Mall truly has it all. The Branson Craft Mall isn't just a shopping experience, however. 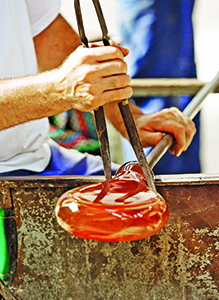 Visitors can witness creation first hand while viewing working craftsmen do what they do best. Artisans include basket weavers, silversmiths, potters, engravers and carvers, as well as clothing, bead and stained-glass artists who not only create wares sold at the craft mall, but even take custom orders and sometimes give classes so others can learn the tricks of the trades. Many of the craftsmen, such as weaver Marty Bartlett who took her first basket class 23 years ago, have been working on their art since childhood and take enormous pride in their trades. "My love for stones began back when I was a kid, on the farm in the Ozarks," silversmith Arlen Evins of Sho Me Silver said on the mall's website. "That love has resulted in stonework and silversmithing of which I take a lot of pride in creating unique jewelry pieces. I do all the stones and silver work right here at the Branson Craft Mall." Of course the Ozarks shopping experience wouldn't be complete without a host of delicious handmade food and snacks. The Branson Craft Mall's Hillbilly Nut and Fruit Co. offers a variety of dried fruits and roasted nuts, as well as jams, jellies, salsas, soup mixes and even local honey. Any visitor with a sweet tooth can satisfy that craving by trying the Branson Fudge Co.'s scrumptious fudge and top it all off with Branson Coffee Co.'s gourmet coffee that's not only ground fresh daily but also sold exclusively at the Branson Craft Mall. Once they start perusing the arts and crafts available at the Branson Craft Mall, visitors are unlikely to soon leave, but that's OK, they can get lunch at the new Pickin' Porch Deli and savor some Ozarks' mouthwatering sandwiches, soups and salads. Located on Highway 165, just a hop, skip and a jump south of Branson's entertainment district, the Branson Craft Mall is open from 8 a.m. to 7 p.m. and welcomes motorcoaches into its ample parking lot.